Photo I took from the summit as the sun rose. Mt. Marcy, the tallest mountain in New York State, with one of my high school friends, his dad, and another scout. 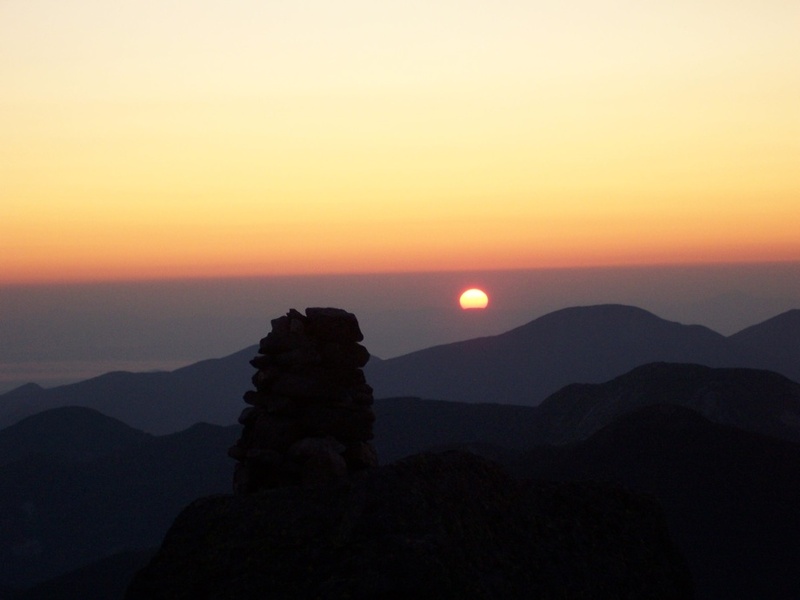 We started our ascent at midnight, reached the peak by 4 a.m., and waited for the sun to rise near five. On our walk up, our breath mingled with the humidity, revealing webs of water vapor in the light of our headlamps. We sometimes talked, but mostly, things were quiet: the shuffling scratches and thuds of our footfalls as we scrambled over rocks, the heavy pants of our breath, The occasional slosh and swallow of our water, and the continued cracking and hissing of wind laced through forest. Now and then, I’d hear an animal, it’s sudden rustle breaking the background. Quiet is a sense of monotony, a pattern, like a radiator rattling and blowing in a classroom. You forget the noise is there. It’s like the air, bearing down on us, stirred up in with fingers, vibrating in pulsing with invisible waves. Yet we feel like nothing is there. Our hiking party eventually hit the end of the tree line, a stunted forest of bent, low pines. The air was cold and violent, filled with the tumult of wind dragging clouds over bare granite. Hiding behind a slab of rock, we had some shelter, but still, I shivered in the cold air. Above, a sky yawned open, almost opaque with moon and star, and the flat horizon had the spine of distant mountains. Clouds washed the peak in mist. The sun rose, and light uncovered an ocean of frozen peaks, the green forest like rolling seawater traced with white granite crests. The air trembled with new heat, and we hikers started our descent, gradually shedding our layers as we hit the humid air. The air ripped with wind and scrapping granite as we slid on lichen and loose stones and descended beneath the canopy. Tree limbs caught the wind and webbed the sun into patterns on the forest floor. Things got quiet again. Silence came at the top of the next peak, Mt. Skylight. We reached the summit in the light heat of a late morning. The wind was quiet, the peak littered with stones that looked like old ruins, broken by grass. We reclined against the bleached ground. I closed my eyes. At last, I heard silence. Free of the rustle of cars, the buzzing of insects, the hissing of wind and leaves, and birdsong, I was utterly alone, as if in a vacuum. The silence was an opaque wall of nothingness opening up from some deep, primordial place—like lava in a volcano.It came over me, flooded me, sweeping through my being. I had never known such healing. The echo of that silence remains, its own particular timbre a hidden frequency that slices through a room and catches my ear. I’ve been in quiet rooms before—rooms with only the faint rustle of a curtain or the occasional cough of an occupant—and I must sort through the quiet. There, I find silence, somewhere it its rustles. Note: I wrote a similar peace for class that ended up at Scholar’s and Rogues, found here.